Flat blades made from carbon & stainless steel. All Crinkle & V-Slices from stainless steel. 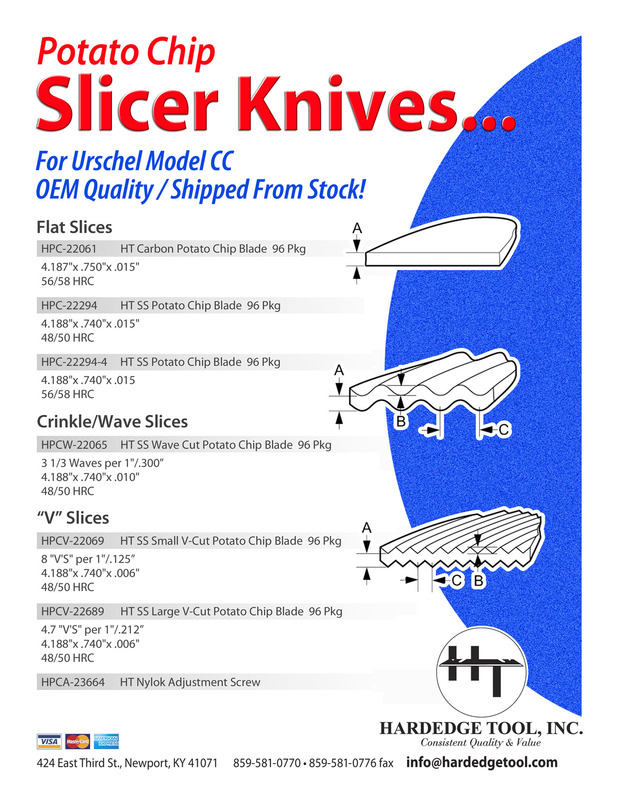 HPCW-22065 HT SS Wave Cut Potato Chip Blade-96 Pkg-3 1/3 Waves per 1″..4.188″x .740″x .010″..48/50 HRC..
HPCV-22689 HT SS Large V-Cut Potato Chip Blade-96 Pkg-4.7 “V’S” per 1″..4.188″x .740″x .006″..48/50 HRC..
HPCV-22069 HT SS Small V-Cut Potato Chip Blade-96 Pkg- 8 “V’S” per 1″..4.188″x .740″x .006″..48/50 HRC..
HPCA-23664 Nylok Adjustment Screw-8 Pkg.